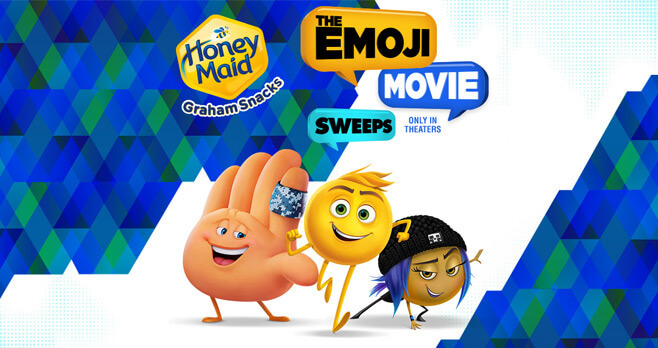 In celebration of The Emoji Movie, opening in theaters on July 28, 2017, Honey Maid Graham Snacks is inviting you to participate into the Honey Maid The Emoji Movie Sweepstakes by registering online at HoneyMaidEmoji.com for a chance to win a movie screening in your hometown for up to 300 guests. Plus, 10 other lucky winners will each get a set of 10 Fandango Promo Codes to see other summer blockbusters. Take a photo of your full receipt. Visit www.honeymaidemoji.com during the Sweepstakes Period. Follow the instructions to complete the registration form. Upload your receipt as directed. Once the image of your receipt has been received and validated, you will receive one Sweepstakes entry. One (1) Grand Prize: A movie screening in winner’s hometown and snacks for winner and up to three hundred (300) guests. ARV: $2,000. TEN (10) First Prizes: A Ten-Pack (10) of Fandango Promotional Codes. ARV: $130. Promotion is open only to residents of the 50 United States, the D.C., and Puerto Rico, 18 years of age and older as of the time of entry. Promotion begins at 12:00 am ET on July 1, 2017 and ends at 11:59 pm ET on August 31, 2017. For a winner list, visit http://bit.ly/2mpTAK3. The winner list will be posted after winner confirmation is complete. Sponsored by Mondel?z Global LLC, 100 Deforest Avenue, East Hanover, NJ 07936. For complete details, including Official Rules, visit honeymaidemoji.com.